Updated to include a biography of the three latest governors, one of whom is United States president Bill Clinton, this new edition includes fascinating individual profiles of the state’s forty-three consecutive leaders since 1836. 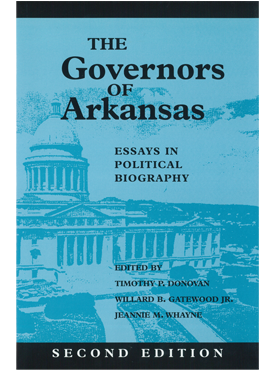 From Conway to Tucker, the biographical sketches are filled with valuable personal and political data detailing each governor’s origin, family, education, occupation, and accomplishments and failures while in and out of office. By examining the issues confronting Arkansas’s governors, the contributors have provided a provocative portrait of the state’s political leadership and have explored a whole range of social and economic questions.